Triumph made great capital of the standard nature of the models used in the ISDT right through the fifties and sixties. By chance or by design, these now essentially road twins, produced great low to mid range torque and with plenty of flywheel effect all the single carb models from 350 to 650 cc provided excellent grip on climbs and in muddy going. When a burst of speed was required for special tests, or the final day’s road race, the twins were also capable of punching out good top end speed for their day. Triumph’s claims were in great measure the truth, the ISDT machines were off the assembly line and mechanically largely standard, but its also obvious that the bikes did need critical modifcations, plus a large amount of special preparation. While the IDST in the 1960s was turning year by year into a sterner off road test, Triumph themselves were steering their production Trophy models ever more towards the tar seal. Earlier Trophy models had of course been more off road oriented, never more so than the original pre-unit Trophy models and the later unit construction AC models, made primarily for the USA enduro and desert racing market. However Triumph's off road interest was waning and following the 1966 ISDT the factory competition shop was closed and ISDT efforts were handed over to dealer teams. By the time my 1968 donor bike was built even the T100C model was all but a road machine, the twin high pipes in practise were more likely to give third degree leg burns than effective off road action. My project happily is a fantasy out of time, perhaps the bike that Triumph might have built in 1968 had the competition shop still been in business and who knows the sort of production machine that may have found some traction in a market that ironically was on the verge of an off road boom. Despite the marketing mistakes that were to follow, by the mid sixties Triumph’s long experience at the ISDT game had shown just what areas needed to be modified to make the twins effective off road. 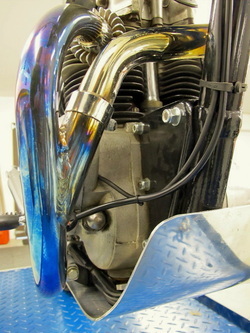 Two such details were the fuel tank and exhaust. In the case of the exhaust Triumph’s stylish twin low mounted road silencers would barely have lasted a day of off road use and would be certain to stop forward progress in even a modest rut, while the stock tank carried more fuel than was required and was rather heavy and bulbous. Drawing from past Triumph was still able to source inspiration and even spare parts from earlier models. Examples are the TR5 Trophy conical front hub with alloy brake plate and the siamised right side pipes of the 1960s, while some bikes were fitted with right side high level pipes of TR5 Trophy origin. More exotic were the alloy fuel tanks fitted to some works ISDT bikes. While privateers and the likes of occasional factory supported riders like Steve Mc Queen and Bud Ekins rode T120s with stock Triumph fuel tanks, many of the photos I have gleaned of the pukka factory ISDT bikes ridden by regular works riders show alloy tanks. To get the right look my ISDT Triumph would have to have an alloy fuel tank and off road capable exhaust. Considering first the exhaust I best fancied the left side TR5 Trophy system, but chance intervened when British Spares confirmed that they had a siamised sixties-style right side pipe in stock and by using a universal cranked muffler the right look and effect might be gained. Certainly the exhaust tucked well under the footpeg and the crank in the muffler inlet swept the exhust up out of the way of at least the obstacles I would be expecting on the modest trails I would intend to tackle. To achieve the correct angle I had to weld a new bracket to the muffler and in the process created a somewhat stronger fixing. The frame mounting for the muffler strap was formed by cutting and repositioning the stock footpeg hanger bracket to a higher position on the sub frame. On starting up it was immediately apparent that though the accessory muffler looked the business the racket it made was at odds with my intentions to ghost along the trails. After trying various combinations of baffles and tubes a friend suggested I try inserting an aircooled VW exhaust tube into the massive muffler outlet. He was right, a VW Beetle tailpipe with its internal absorption tube killed the noise to just the level I was looking for and as a bonus fitted perfectly inside the muffler. Looking a photos of ISDT Triumphs with alloy tanks it didn’t take me long to work out that what I was looking at appeared to be BSA Goldstar pattern off road competition fuel tanks and that these tanks were also commonly fitted to many one day and long distance trials machines. Trawling the internet led me to the Terry Weedy Avery Products website. www.terryweedy.com/products.html Gathered here are an eclectic mix of goodies for the Brit classic off road enthusiast, including Goldstar pattern alloy tanks. A call to Terry confirmed the tank would fit the Triumph and that he could even send me a tank without the Goldstar cylinder head recess, which would add a little fuel volume. In no time the tank arrived in NZ, well wrapped and looking fabulous complete with Monza style flip top filler. Offering up the alloy tank I found it somewhat shorter than the stock steel unit, but by juggling the position it looked just fine and gave more room for increased steering lock. Looking at various photos in detail it became apparent that various fixing systems were used, including the BSA-style centre bolt and/or additional under tank front fixing on the Triumph stock cross bar mount. My solution to mounting possibly differs to the factory one but I wanted the option to use the stock tank at times for trips involving larger distances, so I opted to add front and rear mounts to the Gold Star tank to suit the stock Triumph frame mounts. These take the form of two turned and threaded tubular alloy tubes at the front and a single sheet alloy tab at the rear. All three mounts use the stock Triumph rubbers, washers and bolts. Once complete the new alloy tank and the sweeping chrome siamesed exhaust did more than anything to evoke the factory look I was hoping to achieve. Now I was crossing my fingers hoping it would work half as well as it was beginning to look.